Alnwick Old Brewery Apartment in Alnwick, Northumberland sleeps 4 people. 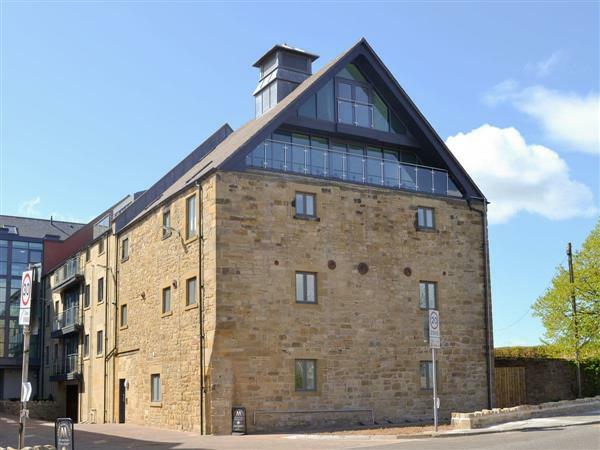 Alnwick Old Brewery Apartment in Alnwick Alnwick is a beautifully presented apartment situated within the heart of the historic market town of Alnwick. Formerly a working malthouse, this unique building is steeped in history and has been converted into a collection of apartments, which simply ooze charm and character. Alnwick Old Brewery Apartment is situated on the fifth floor which can be accessed via stairs or a fully operational lift if preferred. This bright and airy apartment enjoys lovely views across a field, with Alnwick Castle as a backdrop. The living space is open plan and tastefully furnished throughout. There are two bedrooms and two bathrooms making this quality property a suitable choice for couples, families or friends. There is a wide array of amenities including a cinema/playhouse, restaurants, independent shops and a variety of pubs available within easy walking distance. Alnwick Castle, home to the Duke of Northumberland (and film location for Harry Potter’s Hogwarts!) is a popular visitor attraction and is only a gentle stroll away. Or visit the Alnwick Gardens; a spectacular interpretation of a formal garden, including a grand cascade waterfall and poison garden and guests can dine in the restaurant of the largest tree house in Europe. Alnwick Old Brewery Apartment offers stylish accommodation that gives easy access to explore the beautiful 20-mile stretch of Heritage coastline designated as an Area of Outstanding Natural Beauty to the east and the wild and lonely expanses of the heather-capped Cheviot Hills to the west. Readily accessible by public transport, the apartment is 4½ miles from Alnmouth (by rail on the main East Coast line) or by bus, 200 yards, which also runs to Alnmouth and its beach. The beach is 5 miles from Alnwick Old Brewery Apartment in Alnwick. With the shop 100 yards, and the pub & restaurant are 200 yards from Alnwick Old Brewery Apartment. Living area: With Freeview TV with BT sports package. Bathroom: With shower over bath, toilet and heated towel. Gas central heating, electricity, bed linen, towels and Wi-Fi included. Garage parking for 1 car. No smoking. Holidays at Alnwick Old Brewery Apartment run from Friday to Friday. Pets allowed at Alnwick Old Brewery Apartment. For a better idea of where Alnwick Old Brewery Apartment is, you can see Alnwick Old Brewery Apartment on the map below. Alnwick Old Brewery Apartment is in Northumberland; should you be on the lookout for a special offer, you can find all the special offers in Northumberland. It's always worth checking to see what is on offer at the moment. Do you want to holiday near Alnwick Old Brewery Apartment (UK3246), you can see other cottages within 25 miles of Alnwick Old Brewery Apartment; have a look to find your perfect holiday location.